Not that anyone needs an excuse to go out and have a great time, but if you did, Cinco De Mayo is the excuse you’re looking for. This annual holiday to honor our southern neighbors, Mexico, and their unlikely victory over the French Empire at the Battle of Puebla. This year in Albany, we are combining all of the areas best bars and packaging them together to create an event you won’t want to miss. Going bar to bar to all of Albany’s best venues, while paying no covers and getting amazing drink specials everywhere you go. It’s a day to celebrate Mexican traditions so expect a whole day of Margaritas, Coronas, Mojitos and you probably guessed it, Tequila shots! The party starts early in the afternoon so you’ll have all day to get around and try all of the amazing drink specials in town. 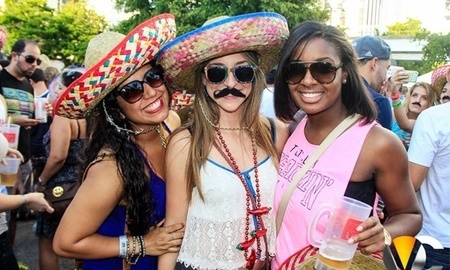 Grab your friends and your festive sombrero and join in on the 4th Annual Cinco de Mayo Pub Crawl in Albany. At registration, our event staff will distribute full guided pub crawl maps and wristbands to all pub crawl participants. The map will show you all the amazing places you can go as well as the drink specials they are offering so you are sure to find something you like. The PubCrawls.com wristband will grant you free admission into all participating venues and let you access the drink specials. Once you receive everything you need, you’ll be on your own to explore and make memories you won’t soon forget. Unless of course you have one too many of those tequila shots! Use PROMO CODE "METRO" at checkout for up to 20% OFF TICKETS!